The answer is a definite ‘No’. Are all the normal persons can able to clear interviews and get jobs?. Are all the normal persons successful in their life?. Are all the normal persons are good communicators?.Again the answer is No. Then obviously a question will occur in everybody’s mind…. They are speaking without stammering but not successful in their life except a small percentage who excel in their lives.Are majority of normal persons also lacking in motivation?. Only a small percentage of normal persons attaining higher positions say in sports, politics, writing,acting,singing,music composing, becoming industrialists,IAS officers, doctors,engineers, CA’s etc. Even among the above,only a very few attains the peak. Why?.More hard Hard, more motivation, more luck, more thinking power,God grace than others? or more motivation? First of all let us see what is motivation?. The definition of motivation is as follows. “Motivation is a psychological feature that arouses an organism to act towards a desired goal and elicits, controls, and sustains certain goal directed behaviors. It can be considered a driving force; a psychological drive that compels or reinforces an action toward a desired goal. For example, hunger is a motivation that elicits a desire to eat. Motivation has been shown to have roots in physiological, behavioral, cognitive, and social areas”. Basically motivation is a psychological factor ie actions carried out from brain which turns into person’s behavior. To my understanding, it is very tough to change / alter person’s natural behavior such as style of speaking, style of walking, style of eating, style of sitting, style of drinking etc. Because God created each human as unique with unique behavior. So changing one’s behavior is not an easy task (Against God’s will!). It requires lot of motivation. It is a moot point whether God has given enough motivational power to every individuals or only to a selected individuals (based on past karma)?. Are all the individuals capable of fully utilising their motivational power or only a very few?.Or lack of interest of the individuals to use this power? Of course I am not having answers to all these questions. Coming back to motivational power of pws, are they really lagging in it?. Here I wish to inform a statistical figure about stammering. It is generally believed that 4% of people are stammerer. From my experience only 5% among the stammerers are successfully overcome their disability. Then what about the balance 95% pws?. Are they not really having enough motivational power?. Though stammering starts as a neurological one during childhood, it grown up as a psychological one during adulthood. As already mentioned earlier, it is not easy to change one’s psychological behavior. So to overcome stammering also. Then a question may arise in everybody mind that How come the 5% of the pws were able to overcome their problem?. May be a powerful incident might have happened in their life which force them to do anything at any cost to speak well. May be their surroundings favors them for successful practice and implementation of speech therapy. May be their family members whole heartily supported them. (It is very important to have family support for all pws to successfully overcome stammering irrespective of other supports they receive). But in most of the cases, either pws is not asking family support or the family members not rendering support to pws because of ignorance. Here I explain the cases of 3 pws where their family members are not giving support due to one or other reason. Everybody in this forum know very well that one pws from Chennai had undergone speech therapy recently,practicing everyday and he is speaking fairly well now. Now the problem for him is, his father had received Rs.2 Lac as loan from a bank for his studies and the pws unable to return back the loan for the past 4 years as he is still unemployed.Now the pws is under tremendous pressure to return back the loan from his father (I am not finding fault with his father as he is poor man and he is also under great pressure to repay the loan,want to see his son getting good job and also see son getting married) at the earliest. Though the pws is having so much of motivation and also know techniques to overcome stammering, his father is pressurising him. How can he able to practice everyday?. Whose fault is this?.I do not know the answer again. May be his karma or fate!! In the second case, a pws lost his job due to recession in I.T sectors. But his wife was not accepting this fact and instead criticizing his stammering for losing his job. After putting great effort, he got a job in middle east and now he has gone there leaving back his wife and children in India. He also a very motivated pws, regularly attended SHG meetings but because of fate he has gone to abroad. Who has to be blamed in this case?. Another pws who is also highly motivated having another type of problem. His wife is not allowing him to speak with their son for the fear that the son will also become stutterer if he speaks to his father. 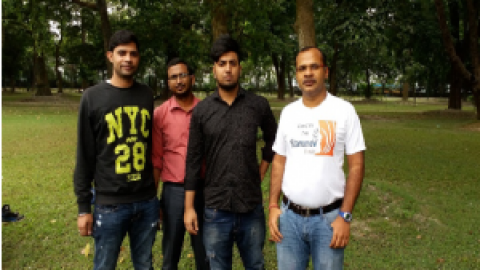 All the above 3 pws are having enough motivation but they are under tremendous pressure and how can their mind allow them to practice some techniques to overcome stammering?.Everyone will agree that meditation is one of the best to control stammering. But with these kind of backgrounds, can anyone able to do meditation for even 5 minutes?. Many of pws who is reading may wondering why I have written such a lengthy mail. I am coming to the point now. As I mentioned at the beginning of this mail,as a Co-ordinator of the Chennai SHG for more than 4 years and having contact with about 100 pws, I could not able to persuade even 10 pws for monthly meetings. Why?. Is I am doing something not correct?.Is I am not fulfilling their expectations?. To be honest I am doing what I know. May be pws expecting fast curing and for that I have no solution. 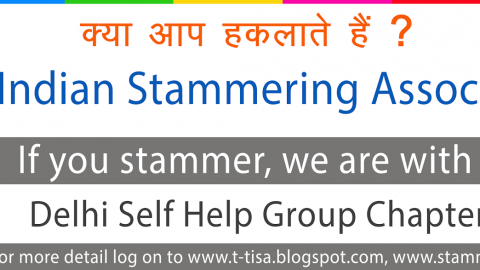 I am a staunch supporter of TISA concept of ‘Acceptance’ of stammering. I am giving most importance to this concept, but it is not working on many pws. Because it is very difficult to understand the ‘Acceptance’ concept and put it into practical life.There are 1000 ways of acceptance and each pws after learning a few ways,implement it in daily life and mistakenly believed that even though after accepting their stammering, they are still stammering. From my understanding it is not correct. Because they are not learned all the acceptance. But it is also not possible for everybody to learn all the acceptance. Now let me come to the motivation of pws to overcome their disability. Initially I was also under the opinion that stammerers are less motivated and they are not utilising the opportunities given by TISA. But now I understood that pws are also having the same level of motivation like normal persons and only a small percentage are able to fully overcome their disability like those of a small percentage of normal persons who have reached peak in their lives as I already mentioned earlier. So generally it is nothing to do with motivation factor for pws for not over coming their disabilities. Then, what is the solution? Is there any other WAY FORWARD?. Though there is no specific answer, we can try another method along with acceptance concept. The new method should be in such a way that there is no need for applying motivation and it must be a simple and easily adoptable one. What is the method likely to be tried out?. FACE THE FEAR ALWAYS. Pl read it again that it is not ‘FACE THE FEAR’ but ‘FACE THE FEAR ALWAYS’. ie we have to face the fear always (24X7) rather than facing the fear for few occasions only in a day.In a simple terms we have to say what we want to say without word substitution with stammering or with bouncing or with prolongation or with voluntary stuttering at all the situations. In this way, our fear and shame will vanish faster and we can speak better. All the SHG meetings by TISA are either being held in a closed room or in a park ie more or less in a comfort zones. This is just like attending theory classes. We need more practical classes ie speaking outside our comfort zone. Here afterwards no more theory classes for about 3 months in Chennai SHG. Meetings will be held at beach, shopping malls and practice the techniques (learned in theory classes)such as bouncing, prolongation, voluntary stuttering during shopping to get rid of our fear and shame.This is a tough one for youngsters and new pws but easy for coordinators.So ‘FACING THE FEAR FOR 24 X 7’ needs no motivation but requires lot of courage. I think all the TISA coordinators are very courageous persons and they have to take a lead and show the path to young pws. I suggest to all the TISA coordinators to conduct theory classes fo the first 6 and afterwards, only practical classes. Let us try this one. Dr.Sachin has done this on many occasions. I do not know how many pws understood after reading such a lengthy mail what I want to say.If anybody is not understanding,then it is my fault only since I have not expressed clearly. They may ask any clarifications to me. Thanks for spending time to read this mail. Thnaks Mani for this "Dil se" post.. I agree that many pws are not looking for speech techniques.. They are looking for a broader kind of help.. May be they need career counselling; may be they need "relationship" counselling; may be they need to approach a senior colleague like YOU, with their wife, father, family- and discuss things openly and whole heartedly.. In my medical experience- discussing freely with someone you TRUST, helps more than medicine, quite often..Your problems may not vanish magically, but you are able to see clearly, what is holding you (and your family members) back..
Second point: YES, SHGs are a place for trying out new ideas.. If one does not work, try the next idea..WE should never give up hope.. Thanks again for sharing your thoughts.. Thanks Mani for such an elaborative post. I think the first rule about dealing with stammering is to push yourself out if your comfort zones regularly. At least twice or thrice a week. When you are out getting into such speaking situations, you are sure to make thousands of mistakes.Sometimes your confidence level will increase. Other times you will feel that you are not making any progress. But the 'catch' is make sure not to allow anxiety over power you. The above rule works. Please try. Thanks mani sir for this post. Yes it is very difficult for a PWS to recover, if he have not get "comfort zone" even in his own family. I told to my parents – I met a great monk/ astrologer and he told- if you starts to read religious scripture (sundar kand, a part of Ramayn) Loudly for 2 yrs, your all problem will be solved. I started to read it loudly so that most dominating person of family and even neighbour also can listen me. as all religious scriptures reading pattern is fixed and need little prolongation, so one can read it with out stammering with variations in volume & pitch. speaking without stammering for one hour slowly slowly increase self-confidence & fluency, high volume increase comfort zone. The mother who prevents the child talking to pws father needs to be told- that by doing this the child will never learn a lot of things which only father can teach.. Child's training will be incomplete.. The child will also never learn how to deal with people who are different.. She is doing more harm to child than good, and may not even realise this.. Unfortunate.. Can she be asked to talk to the family doctor on this issue? Thank you Mani Sir for the insights. Yes Support of family is very essential in this.. But more important is that we should ASK for help.. nobody else can understand what is going-on in our head.. they see it as no problem or minor problem. When I was studying there were 7 of us staying a 1bhk house, all hopes were pinned on me to bail them out – the first engineer in my hometown Rajasthan!. The pressure was too much. I approached my Mom and in no uncertain terms told her that I need a separate room to study for interviews (I could not tell openly about stammering but I said I need to prepare for interview) I told her without good preparation I cannot clear interview and all your investment on me is will be waste. We rented a small-room for 6months where I could do some mirror practice/loud reading and some how got through an interview..